We now produce 20 times more plastic than we did in 1964, a vast rubbish-scape of bottles and wrapping and hard plastic lids that is expected to double in size in the next 20 years – and almost quadruple in size by 2050. These were the findings of a 2016 report by the World Economic Forum and Ellen MacArthur Foundation, launched at Davos last year. The report, The New Plastics Economy: Rethinking the Future of Plastics, analysed the flow of materials around the world and predicted that, given the projected growth in production, by 2050 oceans could contain more plastics than fish. Economically speaking, this meant a loss of as much as $120 billion in plastic packaging material value every year. 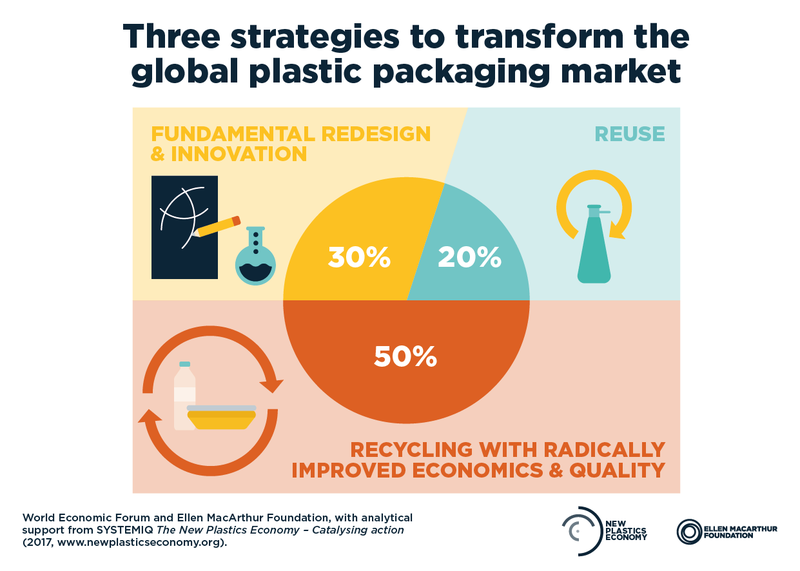 Our findings prompted us to set out a fresh vision for an all-new plastics packaging system, one that connected packagers with policy-makers, capital cities and philanthropists, in a combined effort to phase out harmful production patterns and business models. So how well has it worked? After a year in action, a new report, launched today, takes stock of commitments by government and industry, as well as leading players in the plastic-packaging supply chains. Among the achievements listed in A New Plastics Economy: Catalysing Action, are new bans on single-use carriers bags, cleaner production strategies among industry leaders and a groundswell of consensus that has given rise to movements such as #breakfreefromplastic. But the new plastics economy isn't yet here. To help us over the threshold, the report suggests three decisive strategies. 1. Improve the way we design, recycle and re-use plastics. About 30% of the plastic we create is destined for landfill (or the ocean). The report urges a fundamental rethink of the way we design packaging, in order to make what happens to it, after we've used it, a little less hard on the environment. 2. For at least 20% of plastic waste, re-use is an economically attractive option. New and creative delivery models based on reusable packaging could unlock an economic opportunity to the tune of $9 billion, according to the report. 3. For the remaining 50% of plastic, we need to make recycling pay. Improving packaging at the design stage would make recycling easier. It would also make it more profitable than sending plastic waste to landfill. Underpinning these three actions, say the report's authors, is the issue of how plastics are made. A lot of plastic is currently derived from crude oil. But it doesn’t have to be: switching to renewable sources such as natural gas or the by-products of natural gas processing would bring us many steps closer to a greener, cleaner plastics economy. All it would take is some circular-economy thinking, and for everyone – from packagers to politicians to the people who buy the products – getting on board. The fish are counting on us.